Most damaged wooden structures can be repaired with minimal disturbance - these include joists, lintels, tie-beams, rafters, bressumers, wall plates, posts, wind turbine blades, flag poles, glulam beams. 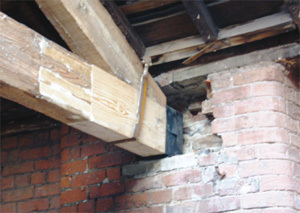 For more information about Property Repair Systems Structural Timber Resin Repairs see references. 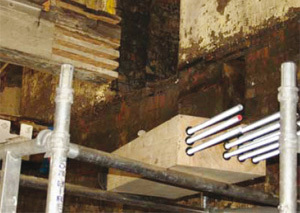 Timber Repair Review - Issue 1 - click here to read Issue 1. Timber Resin Splice in the foreground, slotted parent behind. Finished job ready for sanding. 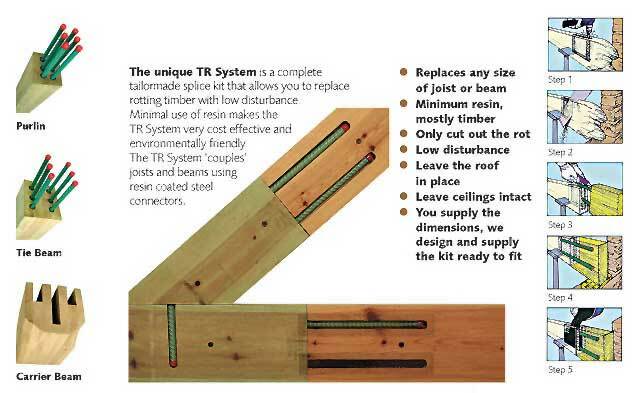 Timber-Resin Splice (TRS) family of repair Kits - easy to fit, minimum loss of good wood and minimal damage to the building. FREE - Self Training Course Download - self service rot repair Course - click to download. Dry and Wet Rot Help - what type of rot do you have? How do you treat the rot and prevent future rot? Property Repair Systems expert staff can help you with all kinds of timber repairs and are more than happy to give further information and advice.